Graphics students from Brockenhurst College have submitted designs for a new village sign for Brockenhurst after the parish council sought their input. Thirty-two student designs, along with entries from local schools and residents, were put forward to councillors, who will now select the best ten. The ten designs will then be exhibited at the Annual Parish Meeting at Brockenhurst Village Hall on the evening of April 24th. Students and villagers have been invited to attend the meeting and vote for their favourite design, with the results helping the council select the final design. Councillors encouraged the students to be creative, however, submissions had to include artwork that was representative of the village, its location, and its history. 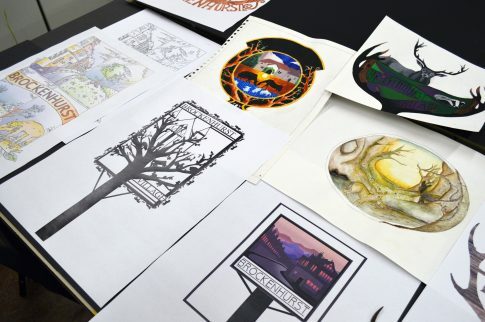 The students produced designs using a variety of different techniques, including digital illustration as well more traditional methods such as painting and paper cutting. Graphics student Evelyn Rickard-Saggs said: “I’m relatively new to the area so it was really cool to learn about the history of Brockenhurst. “It’s really nice to see how passionate the Parish Council is about preserving the wildlife and the history of the village,” she added. Although the site of the new sign is yet to be confirmed, possible locations include Waters Green Junction, Grigg Lane, Butts Lawn, and the green space by the water-splash in the village centre.